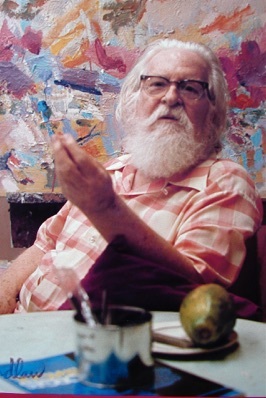 One of the earliest abstract expressionists in the Cincinnati, Ohio area, Paul Chidlaw (1900–1989) was a colorist who painted in oil, watercolor, acrylic, etchings, pastel, charcoal, pencil. His artwork is displayed in the Cincinnati Art Museum and Xavier University. Chidlaw was an instructor at Our Lady of Cincinnati College (now part of Xavier University) and taught at the Art Academy of Cincinnati from 1946 to 1963. In his late years, Chidlaw was afflicted with macular degeneration, yet would do black and white drawings every day only being able to see with peripheral vision. He was driven to create something new every day.